It wasn't exactly as textbook as we have seen this year in Georgia (and Great American) for the Blue Devils. 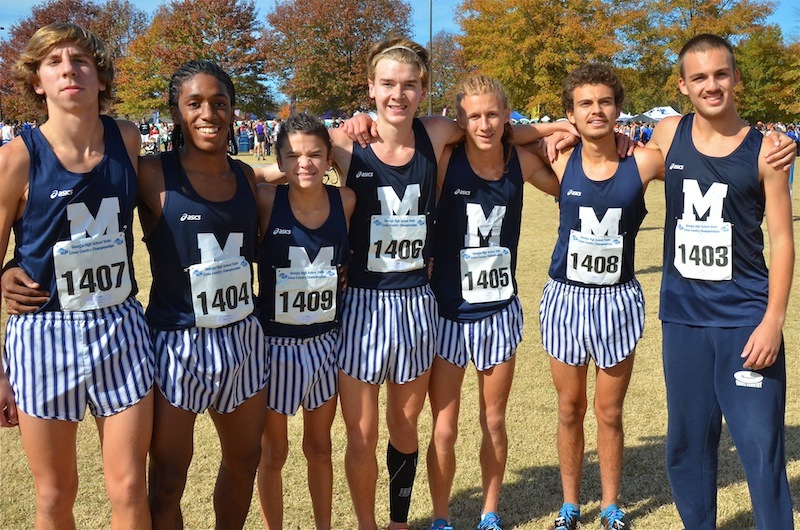 No, 7 Marietta guys did not cross the line consuming many top 10 places or have a super crazy 1-5 Split. 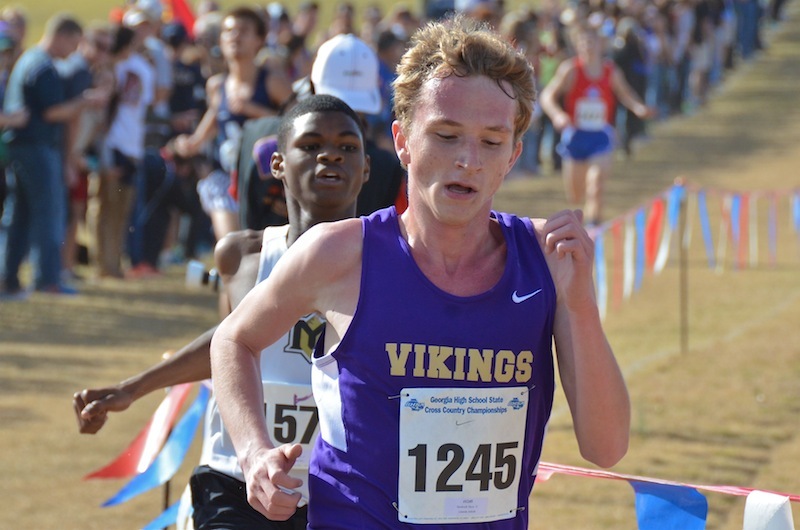 But in 6A Boys state races where there were so many individual contenders going wfo for a title, it appeared they were content to simply run as well as a pack as well as one could in all the congestion and win the team title. But, their 17:00 team average and not too shabby 1-5 Split of :36 was just too strong for anyone to have a realistic chance at beating the Devils. One Devil was within meters of taking the individual crown though as jr Carlos Torres led the pack in placing 3rd in 16:36 instead of Khayvonn Benson. I would wager any of this squad cared less who scored first though. Mission accomplished..on to the next..will it be Nike NXN Regionals? Coach Jack Coleman commented, "it was great to win the big race. After coming in the previous 2 years ranked extremely high (I believe that correct) and leaving with a loss it was fantastic. They are an exceptional bunch of guys who spent the last year working hard to make this day happen. It was great to see them get the result they had dreamed of. We probably got out a little faster than I would have liked in the first 800m, but fortunately they had the strength to hang in there and do a good job finishing the race. The strength of the team all year has been the fact we are a solid team 1-8 (our alternate also) and no one individual makes us as good as we are. If somebody struggles then someone else will step up." I was near the NFHS announcers during the down time in between races hear them discussing what teams would make Podium pushes and scratched down on a their press sheets, "never count out Brookwood at State" Prophetic? no, more like common sense and history as the Broncos once again rose to the challenge, running great as a team on the biggest stage placing 2nd without a single runner in the top 15. It was close as they clipped Mill Creek's wings by 4 points. The difference? A 1-5 Split of :38 compared to the Hawks :58. Senior David Giuliano led the charge for the Broncs' placing 16th in 17:03. To describe what happened with this race may require a video as the action was so fast and furious with positions changing as athletes poked moves at one another. 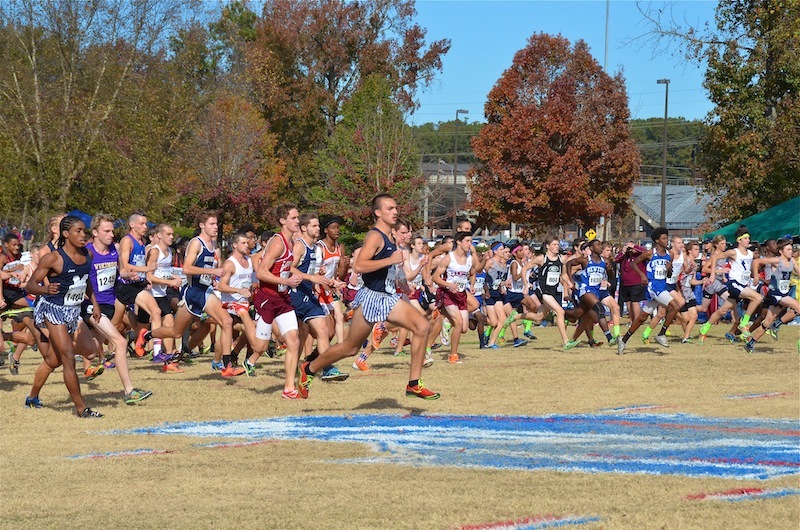 Nearly all of these top finishers have at one time or more been named 6A or All-Class ROWs. What is most interesting (and I noticed this about 5A) The top 12 runners were all from different schools! How often does that happen in any division at State? (OK dataholic, we needs to know now) I hope to add more to this article as I get pics/video, but the Indidvidual crown was up for grabs until the mats as the top 4 were split less than :06 apart. Davis Stockwell of Lakeside led after the 2 mile after cresting the nasty little hill after the playground and as they came down the final finishing fill it was an all out war of who had the most guts and footspeed as Tyler Barber was now matching Stockwell stride for stride. But Davis prevailed in a PTgroup photo finish by .08 ...both having 16:33's. Wow, in XC it doesn't get much closer. 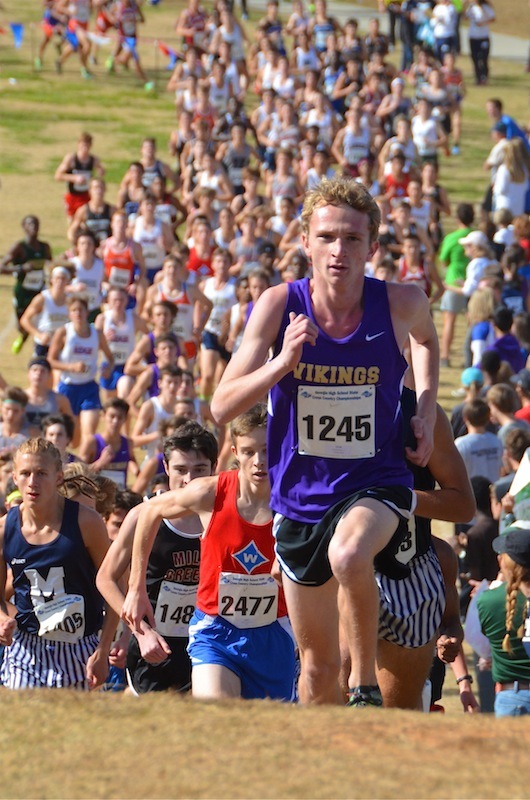 A well deserved victory by Davis Stockwell who some felt was ignored in the preview (we didn't have a pic that small with any clarity, that's our excuse) As for Tyler Barber of Mountain View, he went out there and showed the state what he was made of. How impressive was Barber's performance? Last year he was 80th in the state for AAAAAA. Hats off to that young man for a heck of a race and an impressive finish. Below are the performances entered for the meet that met the national silver standard. 25 National Elites. 134 Elites.